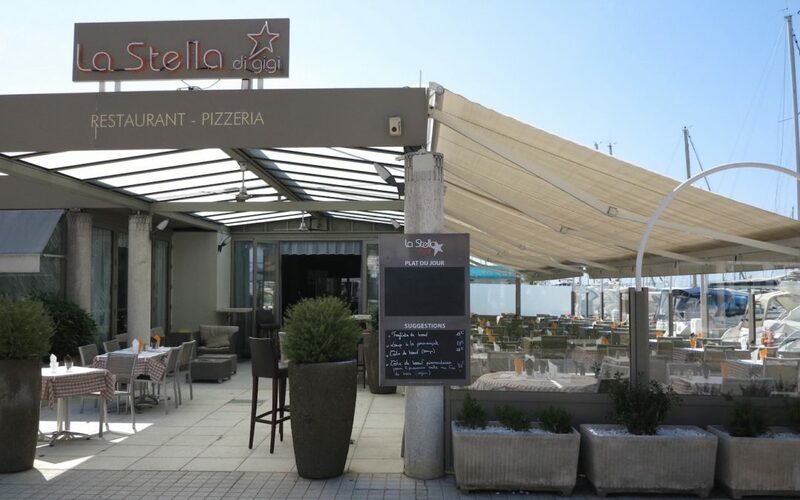 At the mythical address « La Stella di Gigi », in the port Camille Rayon since 1993, the shadow of its founder hangs over the tables and the counter with kindness. Especially since his family took back the reins of the restaurant in 2011. To tell us this beautiful family saga, Estelle Stifani takes a little of her time to dive back into her teenager’s memories with nostalgia and emotion as she mentioned these years of Joy/happiness when Gigi was the conductor before his cooking range. « My father participated in the adventure of the Port development with Pierre Donnet and Camille Rayon .He was involved in the project, as he always was with his town”. Like Three musketeers, the trio of pioneers puts its know-how, its ideas and desires to look farther to serve this beautiful space dedicated to Yachting. In 1990, when the restaurant opened, Gigi make it the place to be for the marina‘s regular customers, but not only. “People were coming from all over the region” remembers Estelle who grew up in this festive and friendly atmosphere. As time goes by, Gigi wants to step down and would like to hand his restaurant over to his family. But his children chose to study in very different vocational guidances. There is nothing easy about this work “I was not ready at the time” remembers Estelle who refused to take the lead when her fathers asked her. The restaurant will be sold to become a pizzeria, a real heart-breaking for Gigi who saw his business losing its soul .After 8 years the restaurant is for sale again. This is when « Gigi » has whispered a word in Estelle’s ear, confirming it was the good moment for her to take the plunge. This time Estelle feels ready and decide to meet the challenge “I knew it was a big challenge for me, for personal and professional reasons, but I dove in .It was necessary to bring back Gigi’s spirit/soul to the place.” What a successful bet for Estelle who manages to give a second life but also to develop the parental establishment. Today, “La Stella di Gigi” employs 11 people all year long. The “brigade” is in charge of organizing festive events such as weddings, anniversaries, seminars, in a unique setting. But Estelle went further in her commitments with the port and her municipality. The association « Quai Sud » is defending the collective interests of the restaurants owners, hotelkeepers and storekeepers on the Port of Golfe-Juan. This association aims to set up a dialogue between professionals, the municipality, the managers and shareholders of the port Camille Rayon. Estelle Stifani remembers the rumbling discontent when the municipality suppressed the free parking lots in town and in the port. ”Everything had to be paid for so people visited less and less”, a storekeepers’ small pit then regrouped to negotiate with the new municipality. It was a difficult and time-consuming process. « It’s necessary to give a lot in order to receive » says Estelle who, in spite of the obstacles still wants to drive things forward .She then wanted to create a link between the old port and the new port of Golfe-Juan. “A Visual” as she names it, that to be given concrete with the organization of the “night markets” every summer that revive the port, the shops, and the surroundings of the site during the summertime. A Christmas market is also organized at the “Théâtre de la Mer” in collaboration with the council of Vallauris Golfe – Juan .A cultural understanding with the city, the association “Golfe évènements” and “Quai Sud” allowing the artists to exhibit their work all over the town and the visitors to admire them, securely. All these Ideas coming to fruition and foreseeing countless possibilities must please “Gigi “and encourage Estelle to renew her commitment for and around the port.